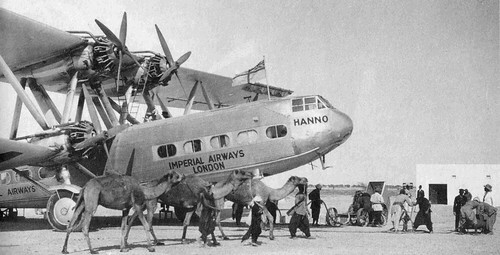 IMPERIAL AIRWAYS Handley-Page HP42, originally uploaded by old school paul. On August 25th on this year, British Airways turned ninety years old. (I realise I’m a few days late posting this, but better late than never.) The airline can trace its lineage back to predecessor Air Transport and Travel (AT&T), which launched the world’s first daily international flight from Hounslow in west London to Le Bourget, Paris, on August 25th, 1919. In November of the same year, it won Britain’s first civil air mail contract, and went on to garner some accolades for reliability. But by 1921, AT&T was in stiff competition on the London-Paris route with five other airlines—two British, three French—and the French were receiving government subsidies. The British airlines protested by shutting down, which only resulted in most of them going out of business and their aircraft being sold. Daimler Air Hire acquired AT&T in 1921 and changed its nomenclature to Daimler Airway. The company operated a London-Manchester local flight as well as several international routes to the Continent (among these were a code-share with KLM, operating between London and Amsterdam). The British government, meanwhile, was eager to stimulate development of commercial air travel (having the government-funded French and Dutch airlines as templates), so it convened the Hambling Committee. In 1923, the Committee recommended government subsidies and the consolidation of four different British airlines into one large monopoly, Imperial Airways Ltd.
Imperial would eventually give its passengers a multitude of legendary aircraft, including the slow but luxurious Armstrong-Whitworth Argosy, the Handley-Page HP.42, and of course the Short S.23 Empire flying boats. The famous Speedbird logo was also developed for Imperial in the 1920s. Although used in its advertising literature, Imperial made no use of it on its aircraft. The airline would also pioneer such staples of air travel as passenger meal service and in-flight movies (the world’s first was 1925’s The Lost World). Imperial’s route structure spanned the Atlantic, to Canada and the United States; it stretched south to Cairo and Cape Town; and most famously, through the Middle East to India, Australia and New Zealand. By 1939 the British government had reversed itself and was now considering handing over Imperial’s routes to a more efficient rival (founded in 1935) called British Airways. Alas, the outbreak of war in 1939 precipitated other plans. Imperial and British Airways were merged into British Overseas Airways Corporation (BOAC), and BOAC’s aircraft and crews were impressed into RAF service. Quite a few were lost through the course of the war. During the war, the Speedbird logo started to appear on BOAC aircraft as an identifying mark. With the arrival of peace in 1946, BOAC’s European routes and assets were split off into British European Airways (BEA). With the rise of civil air traffic control. BOAC used its logo—Speedbird—as a callsign, while BEA flight identified themselves with “Bealine”. The two air carriers would eventually be reunited in 1974, creating the British Airways we know today. As you know, BA still uses the Speedbird callsign, although the logo (or marque) has evolved into something much different. The Daily Telegraph has an interesting 25-image pictorial of BA through the years; the only jarring note is this image of current and former stewardess uniforms. The 1970s are most often remembered as the era of fashion atrocities: huge bellbottoms, huge lapels, huge sideburns; so I am a little aghast that the 1974 uniform looks more stylish and well-tailored than the current garb.